Sun at Six is a Brooklyn furniture design studio interested in how spaces affect our everyday choices and how we interact with others. We want to design spaces to nourish relationships that matter. Great furniture begins with quality materials: raw, sustainably sourced white oak, house-made tung oil, and full-grain, vegetable-tanned leathers that patina with age. We work to bring out the natural character already present in our materials. People matter to us. We source leather from with a family-owned tannery in Italy, and work with traditional Chinese joinery masters, who hand build each piece of furniture using fading, ancient joinery techniques. We make our furniture using classical Chinese joinery, a fading traditional artform passed down from generation to generation, which uses intricate, interwoven joints to create furniture without the use of any nails or screws. Today, the use of traditional joinery techniques has begun to fade. The complex joints are more expensive and difficult to cut, and fewer craftsmen remain who possess the specialized knowledge required. Though production of classical pieces has dwindled, we aim to create new opportunities by applying traditional technique to new design. We work hard to find quality, sustainably sourced hardwoods, which are air-dried, hand-sealed, and carefully kiln-dried according to our own recipes. Finally, our pieces are finished with our own tung oil, pressed and made from raw tung tree nuts. Email us and say hello! Designer: Unknown Manufacture: Unknown Period/style: Mid-Century Modern Country: US Date: 1950s. Ingmar Relling style easy green leather lounge chair. Upholstery: original, dark brown leather. Good condition. Given the age normal use traces/ wear, 1970s. 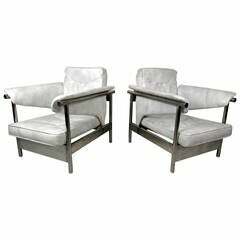 Pair of black leather with chrome chairs lounge chairs by Airborne, France.